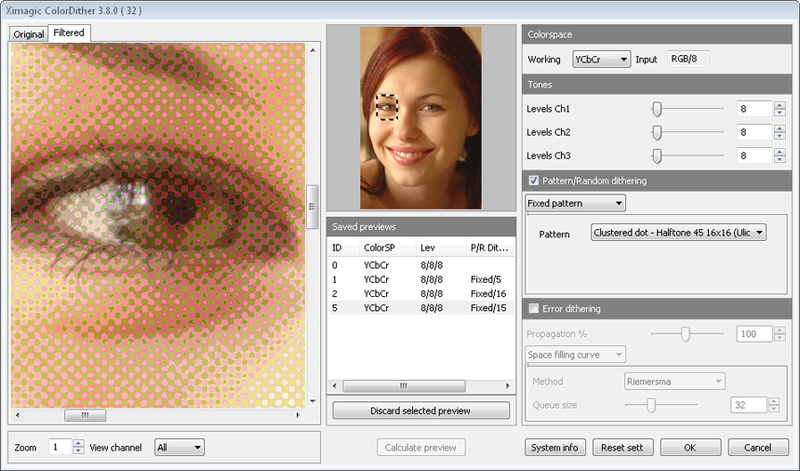 The plugin accept RGB color and grayscale images. Saved Previews Each time a calculate preview is issued (partial or full) the result is temporarily saved. A saved preview can be viewed by selecting the corresponding line in the saved previews table. Colorspace (RGB/YCbCr/CIELab) Usually, it is better to work on a colorspace which separate color from luminosity as YCbCr or CIELab. Channel 1 levels Levels of 1st channel. Channel 2 levels Levels of 2nd channel. Fixed pattern Select one from the values. There are diffusion and halftone patterns. Pattern: Select one of the values. Load Button to load a custom threshold pattern from a file. The file must have the format explained in the custom pattern (below). % Error propagation Value of error diffused default 100%. Serpentine scan Select serpentine scan of image. Custom threshold patterns can be loaded from files with the appropriate format or from images. After a pattern is loaded it remain stored until the user deletes it. Open the threshold image in the editor. In the load dialog, fill the pattern name, select from image, and push ok button. When the image is loaded, a message box with the width and height of the pattern will appear. The plugin will end. The image selected in the editor is the threshold and the plugin should end to allow the user to select another image.